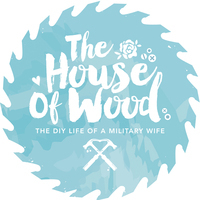 A musician, military wife, and mother of two, Jen Woodhouse authors The House of Wood as her creative outlet for all things DIY and design, a place where she documents her adventures in designing and building furniture and tackling home renovation projects. A self-taught carpenter with a fearless DIY spirit and a penchant for problem-solving, Jen offers in-depth tutorials that inspire and encourage readers to build their way to a more beautiful home. What awesome storage idea this is, can't wait to make this. FINALLY an option for renters! This is great, my daughters even want it in their closets! Beautiful console table! Wonderful work! Do you have the plans that you used for this. Do you have plans that you used for this? really like it! need the plans tho! oh my gosh, I am looking for something for my girl scout troop to make and this would be perfect.... can you give the plans or a little detail? Yeah where r the plans to build it?? Hi, Mike! Jen actually does have the how-to for this project! Check out this page right here: http://jenwoodhouse.com/diy-restoration-hardware-toddler-bed/ Hope this helps, and if you build a bed, we'd love to see it! Jen, this is gorgeous. Do you have plans for it you could share? where can I get Ana White's plans that are mentioned?